The smoke was not unlike a living thing, a wild animal that he had to claw through to get to her. But he did in the end. He had never met her outside his dreams, never been close to her aura outside his secret, desperate longing until now. Yet an unerring instinct led her to where she lay, appropriately in the centre of the flames. Not far from her was the bounty hunter, Jango Fett. Not dead, but he would be soon. Vader didn’t give him any heed, all his intent drawn to the woman that lay so near but so tantalizingly out of his reach. She lay on her side and face, her arms flung over her head. The robes that she wore were scant protection for the flames that were drawing ever nearer to her. She wasn’t dead either but in a few minutes, before the flames even got to her, the smoke would choke her. 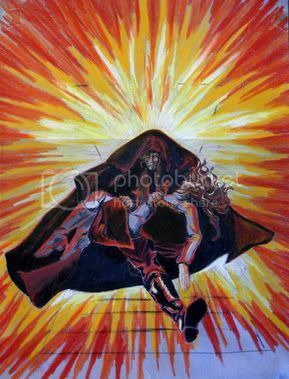 The Sith hesitated only long enough to throw his hood over his head, then he leaped through the fire to her side. There was no time to freeze the moment, the instant when he had her in his arms, her small body – he had no idea that she was this tiny – cradled carefully in his arms. His hands shook a little when he covered her face and neck gently, tucked her into his shoulder, and got to his feet. The flames seemed to have risen like a wall, barring his way. There was an agonizing moment when he couldn’t remember in which direction the gangway lay. He forced himself to think, to focus on escape and not the creature he held in his arms, on the strangely painful yet exhilarating emotions her proximity was affecting his body. That way. He drew in a deep breath, held her firmly and jumped through the flames. He landed on a run, all but flying down the gangway, the flames hard at his heels. No normal being could have made it out of that ship alive. It was on the brink of the final, obliterating explosion and every inch of it was yellow with fire. But the Sith came out of that vessel with his burden, a silhouette of darkness and power, backlit by the flaming ship. He reached his vessel just in time. His unerring sense of destruction had given him fair warning. His own craft was the shield that protected him when the bounty hunter’s ship exploded for the second time. Shrapnel went flying through the air. He imagined the debris raining down on unsuspecting Coruscanti hundreds of metres below and the Darkness that was integral to his nature, smiled at the thought. The storm seemed to go on indefinitely. He laid his precious charge on the ground, shielding her with his arms and body and studied her covetously. Her face was damaged, her mouth and jaw bloodied, she was… When he had looked at her images, he had thought that there were no words to describe her beauty. Now he realized that there were no thoughts. Reverently, Vader pulled off the glove from his hand and cleaned off the blood and sweat from her face. His fingers stained red, and he pressed them to his tongue, pagan like, to taste her blood. Her eyes fluttered open. Deep brown pools of confusion looked at his face. His heart stopped. Senses consumed by her presence, the Sith had barely been conscious of his environment. The shock of horror at his own vulnerability had barely registered before he felt himself thrown a few distances from his vessel. From her. Rage was too weak a description. His blade was alive before he had even got to his feet. The three Jedi in front of him, their own blades alive in their hands. Vader recognized the one in the middle. “Hello there,” was all the Jedi replied. Then he raised his saber in the classic attack position. His companions imitated him. They stood between him and her. Vader felt the saber trembling in his grip. It pulled him forward before he had even made the decision to strike.